Video game giants in $18bn merger! Woowwww!!!!! The companies behind Call of Duty and World of Warcraft are merging in a deal which could shake up the global video games industry. 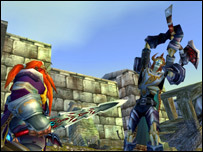 World of Warcraft is played by more than nine million people! US-based Activision also makes hit console games such as the Tony Hawk series and Guitar Hero. Nine million people pay a monthly subscription to play World of Warcraft. Blizzard is the biggest player in online gaming and Warcraft is the global market leader of what are known as massively multi-player online role-playing games, or MMORPGs. It is currently owned by the French media group Vivendi. As part of the merger plan, Blizzard will invest $2bn in the new company, while Activision is putting up $1bn. The merged business will be called Activision Blizzard and its chief executive will be Activision's current CEO Bobby Kotick. Vivendi will be the biggest shareholder in the group. Jean-Bernard Levy, Vivendi chief executive, said: "This alliance is a major strategic step for Vivendi and is another illustration of our drive to extend our presence in the entertainment sector. "By combining Vivendi's games business with Activision, we are creating a worldwide leader in a high-growth industry." The two firms are hoping that their different strengths will combine to form a business which is powerful on every gaming platform and in every territory. Blizzard is strong in Asia, where its Starcraft series has proved hugely popular. Starcraft, a strategy game first released in 1998, is played by millions of South Koreans in gaming cyber-cafes, and by professional gamers on television. Activision has developed a presence on all three new generation game consoles - Microsoft's Xbox 360, Sony's PlayStation 3 and the Nintendo Wii - with franchises such as Spider-Man and X-Men. The games software industry has been through turbulent years, with companies changing ownership and going in and out of business in rapid succession. Activision was formed in 1979 and went through bankruptcy and a series of alliances and mergers before becoming successful. Blizzard had been through a number of owners before ending up in the hands of Vivendi in 1998.